The BIS quarterly review shows that cash in circulation has grown from 7% of GDP in 2000 to 9% in 2016. The Bank of International Settlements (BIS) published its quarterly review this week indicating that cash in circulation continues to grow, even in the most advanced economies. Despite the growth of card payments (that are also used for mobile payments), people’s appetite for cash has not slackened. One of the explanations given by the report is cash’s store of value property that seems to have become particularly attractive following the financial crisis of 2008. Cash usage is up from 7% to 9% of GDP since 2000 in Committee on Payments and Market Infrastructures (CPMI) member countries, with the largest increases being recorded in Hong Kong and Japan (by 9% and 7% of GDP, respectively). 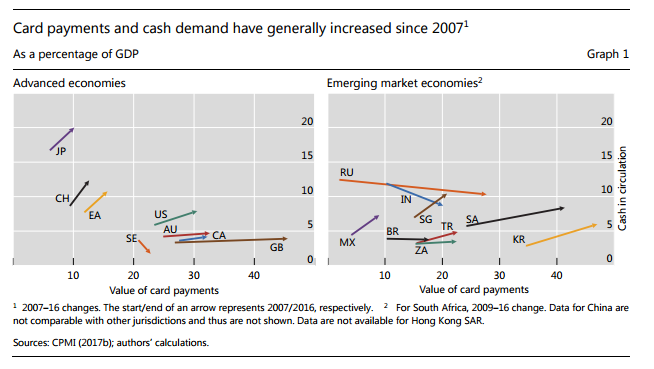 Card and cash payments have been progressing in most countries except in Russia and Sweden where card usage has surpassed that of cash. “The resilience of cash as a social institution reminds us of the importance of understanding the economic functions of money, beyond just the innovations in technology,” stated BIS economic advisor Hyun Song Shin. And contrary to what cashless advocates want to make people believe, cold-hard cash continues to offer important advantages that are unequaled by other payment methods, making it an central pillar of world economies. To read the BIS report, please click here.